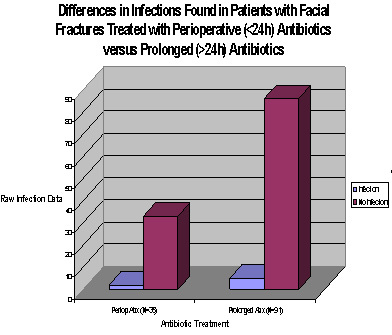 To examine our experience of antibiotic use in the setting of facial fractures to determine whether the application of a 24 hour protocol of peri-operative antibiotics affects the rate of osteomyelitis or superficial wound infection. Blunt maxillofacial trauma patients, managed by the Divisions of Oral and Maxillofacial and Trauma Surgeries, were stratified according to type of fracture: simple or compound; location of fracture: mandibular or LeFort (and type); and, antibiotic duration: perioperative (<24 hours) or prolonged (>24 hours). Excluded patients included: unknown antibiotic regimen, penetrating injury, and gross infection at the time of operative therapy. Examination for the presence of operative infection (cellulitis, osteomyelitis, and dehiscence) was performed at weeks 1, 2, 4, and 8. Over a 42-month period, 312 patients presented with facial fractures of which 126 required operative therapy. Of these, 91 patients received prolonged antibiotics and 35 received peri-operative antibiotics exclusively. There were 5 infections (3 cellulitis and 2 dehiscence) found in the prolonged antibiotic group (5.5%) and 2 infections (1 cellulitis and 1 dehiscence) found in the peri-operative antibiotic group (5.7%) at time of follow up. The difference in the rate of infection was not found to be statistically significant. Treating patients with exclusively peri-operative antibiotics in facial fractures repaired within 72 hours has shown no increase in infection rates at our institution. Standardizing antibiotic usage with our protocol has increased the number of patients that receive only prophylactic antibiotics, potentially decreasing health care costs and decreasing complications associated with antibiotic resistance. 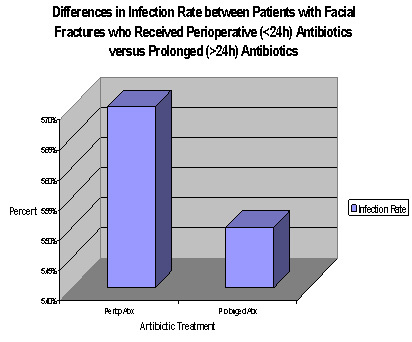 (N=126), 27.8% received perioperative antibiotics only, while 72.2% received prolonged antibiotics. Figure 2: We found no statistically significant difference in the number of raw infections in patients treated with Perioperative antibiotics, when compared to prolonged antibiotic therapy. Figure 3: There was no statistically significant difference in the infection rate of patients treated with perioperative antibiotics compared to those treated with prolonged antibiotic therapy.